A man is in custody in connection with suspicious packages found at military bases in the metropolitan Washington area. Thanh Cong Phan, 43, appeared in court in Washington state Tuesday, a little more than 24 hours after 11 packages arrived at the bases, CBS News reported. Phan previously had written crank letters to the military, CBS reported, and rambling notes included in the packages flagged him as a suspect. 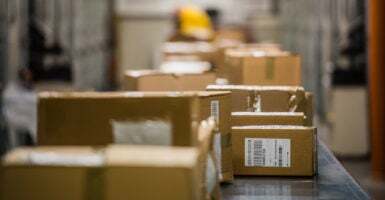 He was arrested Monday night at his home in Everett, Washington, and charged initially with one count of shipping explosive materials, which is punishable upon conviction by up to 10 years in prison. The suspicious packages were left at Fort Belvoir, Fort McNair, Joint Base Anacostia-Bolling, and the Naval Surface Warfare Center. One package tested positive for gun powder and also had a fuse. Another contained a circuit board and a vial filled with an unidentified liquid. The FBI is in possession of the packages and is trying to determine whether they could have exploded. It was unclear how agents found the suspect in what officials called an ongoing investigation. Officials told Fox News Channel that they fear more suspicious packages could still be out there. This report was updated to include the name of the suspect, the initial charge, and his appearance in court. Henry Rodgers is a reporter for The Daily Caller News Foundation.